Well, so much for the end of over-parenting. After a year’s hiatus from that dreaded term – “helicopter parenting” – now you can’t pick up a magazine or go Online without being bombarded by more stories about over-involved parents. They’re monitoring what their kids eat…how they do their homework…even who their friends are. 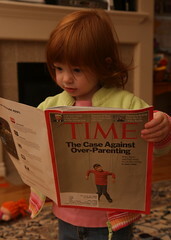 And what’s worse, over-parenting, we now learn, isn’t just bad for the kids. It also makes adults unhappy. They set too high a standard for themselves and end up disappointed. They’re not just exhausted, but lonely. As someone who’s prone to worry about, well, everything, I’m also naturally prone to over-parenting. And yet, I also know that this isn’t the person I want to be. 1. Find somewhere else to put your energy. I think that one of the reasons that people over-parent is that they don’t have any other place to put that energy. This is a criticism often levied at SAHM’s, who are criticized, rightly or wrongly, for making parenting a career. But I know plenty of working parents for whom it’s equally true. They come home from the office and channel all the adrenaline that goes into supervising staff and hitting deadlines into over-monitoring their kids. The trick – whether you work inside or outside of the home – is to have a hobby or some other activity that can sap up some of that extra energy. It might be volunteering at a local homeless shelter. Or joining the PTA. Or becoming a board member at a local charity. It doesn’t really matter. The point is that you’ve got a focus outside your kids. 2. Consult an expert. This may sound counter-intuitive, since one part of over-parenting – in America, at least – is to over-pathologize every single aspect of your children’s behavior in an endless struggle to perfect their shortcomings. Having said that, sometimes seeing an expert can also correct that tendency to do so. I recently took my daughter to see a speech therapist to re-evaluate her lisp. During the course of the evaluation it became painfully obvious that a. my daughter’s lisp is slight b. she herself has no problem with it and c. the therapist didn’t think it warranted any further therapy. Without coming out and saying so (the speech therapist was, after all, English), she basically let me know that this was really my problem, not my daughter’s. And that by insisting that my daughter’s speech could be clearer, I was actually making things worse. Lesson learned. Mouth zipped. Next? 3. Take The Long View. I’ve posted before about how all of my conflicts with my husband can be reduced to one single dimension: I go too fast, he goes too slow. But there’s a corollary to this dynamic which is actually quite useful for confronting over-parenting within…OK, one of us. Which is that precisely because I often gallop through life at breakneck speed, I’m often very focused on the short run. And so with any “flaw” that I detect in my children – i.e., they’re not reading enough, they’re reading too much, they’re not social enough, they’re too social, etc. – I tend to magnify its short-run effects. My husband is really good at reminding me that what matters is the long run. If my son is being silly and goofing off in class, my husband will ask me if I really think that he’ll go through life like that? And when he frames it that way, I realize that I don’t. It puts whatever behavior is troubling me at present in perspective and I can take a huge, much-needed breath. 5. Move to Europe. One of the most insightful things I’ve read on this whole helicopter parenting debate was on the Motherlode blog at the New York Times. It was a comment by a reader from Europe who opined that perhaps the reason American parents are so over-anxious about their children is that they have too many choices and there is too much variance within those choices. In Europe, the commenter argued – and largely because of different public policies – child care, education and even toys tend to be much more homogeneous. And because there are fewer choices and those that exist are of similar quality, parents obsess less over getting “the very best.” This may be a bit of a stereotype, but I suspect that it contains a grain of truth. So if you’re really throwing up your hands right now and just don’t know what to do, remember: You’ll always have Paris. For those who are interested, I was over on Politics Daily yesterday talking about French President Nicolas Sarkozy’s campaign finance scandal. Her basic point is that after more than a decade of fetishizing, second-guessing and micro-managing our parenting, we seem to have hit a new phase marked by slow parenting, bad parenting and free-range parenting. Even the once sacrosanct area of breastfeeding is now open to question. And at least some people are cheering this news. For some, like Salon’s Amy Benfer, the so-called helicopter parenting trend fostered competition between kids of affluent parents while ignoring the basic needs of the rest. For others, like Free Range Blogger Lenore Skenazy, over-parenting infantalized adults while at the same time rendering them nervous wrecks. I know that at least one friend of mine will be jumping up and down with joy. This mother of three recently wrote me a note saying that while she objects to book burning in principle, she’d make an exception for What To Expect When You’re Expecting…in fact she’d host the barbecue in her own back yard. I myself will own up to having read the odd parenting manual over the past eight and a half years. I’ve also indulged in the occasional bad parent essay. Love the Life section at Salon.com. I’m a regular. 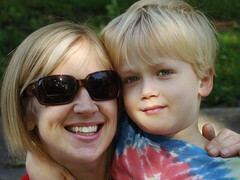 Image: Mommy Sandwich – Week 2 my kids and me by Photogra Tree via Flickr under a Creative Commons License.